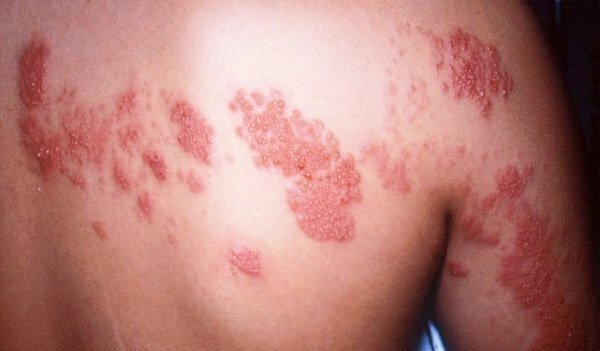 Shingles is basically a skin rash, also known as herpes zoster, however it can present serious complications and is caused by the same seemingly harmless virus that causes chickenpox during childhood. The VZV – varicella zoster virus – which causes chicken pox remains dormant in the nerve cells and reactivates at certain points. Not all persons suffer of this and the causes are still unknown, although extensive trials are currently going on. Shingles is not a transmittable disease, however it is apparently possible for the virus to spread from a person infected to someone who hasn’t had the chickenpox and is not immunized against it. In the beginning it can manifest as a light flu. The main symptoms of this phase are headache and sensitivity to light. In some cases infected persons may experience fever symptoms. Next on the itching starts and a rash on the skin becomes visible. The rash morphs into blisters filled with liquid which then crust over. Besides not looking pretty these blisters also itch and hurt. Shingles may manifest anywhere on the body, however in most cases the blisters are spread in a belt around the middle section of the body. Shingles can be treated and it normally takes about two to four weeks for the blister to clear out. However during this period the person in cause may suffer from debilitating pain and itching. Even after the blisters clear some sings will remain on the skin, maybe even for life. The real issue however is that in some patients even after the blisters clear for good the pain remains, even for several years. Basically any adult is prone to getting the shingles. Any adult that has had chickenpox that is, and that means most of the adults nowadays. One of the main factors making shingles so widespread is that life expectancy in humans has slowly increased in time. Nowadays most people live to be over 80, making them more predisposed to shingle which in most cases manifests itself in people who are 50 to 60. Various studies have shown that pain lingers on long after the blisters are gone. Until a while ago there was no vaccine specifically developed for shingles although a chickenpox immunization vaccine existed. The new vaccine was studied for over 5 years and it has shown great results. This vaccine is actually a more potent form of the chickenpox vaccine and is targeted against herpes zoster. The study was conducted in the US and over 38,500 people over the age of 60 were used, both women and men. Half of the participants were given a new vaccine and halve a placebo, none of them knowing in which category they landed. The test subjects were then followed for 3 years and the results showed that the cases of shingles dropped by 51% and the overall pain level for people who actually got it was 61% lower. This vaccine was specially developed for older persons, however it does not take care of the existing pain called postherpetic neuralgia (PHN) and is intended to be a preventive measure.